Help KFTC get out the vote! This is a critical election year for our voices to be heard, but it only works if you join us out in the fields and on the phones to connect with voters, talk about issues and values, and ask them to vote. KFTC is rising to the challenge with members connecting with their neighbors through community events, door-to-door canvasses, and phone banks. Will you volunteer some of your time? Find an opportunity near you and sign up! Canvassing every Thursday 5-7:30 p.m., Saturday 10 a.m.-1 p.m. and 1 p.m. to 4pm, Sunday 3-6 p.m. Phone banking every Tuesday at the KFTC office, 4-7 p.m.
Postcard writing every other Monday, 5-7 p.m. at Third Street Stuff. CKY Election Results Watch Party - West Sixth Greenroom (109 W Main St, Lexington) from 7 p.m. to 11 p.m. with pizza and Election Bingo. Canvass every Thursday from 5:30-8 p.m.
Phonebank every Sunday from 3-5 p.m.
Every Monday and Wednesday from 5:30-8 p.m.
Sign up at this link or email Molly@kftc.org for more info. Sign up at this link or email Alex@kftc.org for more info. Sign up at this link or email Lesley@kftc.org for more info. Contact alvin@kftc.org if you’d like to join us! More dates will be set soon. Canvassing every Monday at 6 p.m. in Newport, Thursday at 6 p.m. in Covington, and Saturdays at 10 a.m. in Erlanger and 2 p.m. in Florence. Virtual Phone Banking from home, and together every Wednesday from 6 to 8:30 at northern kentucky office. Thursday, November 1, 10 a.m. - 2 p.m. Meet at Roebling Books for lit drop materials. Thursday, November 1, 6 p.m. Canvassing in Covington, meet at Randolph Park. Friday, November 2, 10 a.m. - 2 p.m. Meet at Roebling Books for lit drop materials or to phone bank. Saturda,y November 3, 10 a.m. Meet at Erlanger Library. Saturday, November 3, 2 p.m. Meet at Dairy Queen on US 42 in Florence. Sunday, November 4, 1 p.m. Lit drop in Covington. Meet at Covington Madison Ave Kroger. Sunday, November 4, 5 p.m. Canvass in Covington. Meet at Covington Madison Ave Kroger. Monday, November 5, 6 p.m. Canvassing in Newport. Tuesday November 6, Lit Drops 6 - 9 a.m. Meet at Roeblling Books, GOTV Phone Bank 9 - 5:30 at office. Contact Joe@KFTC.org for more information. NKY Election Results Watch Party - Wunderbar (1132 Lee St, Covington) starting at 6 p.m. Wunderbar has kindly offered to make a donation to KFTC as a percentage of food sales that day. Canvassing every other Thursday, and phone banking on alternating Thursdays. Contact Sharon@KFTC.org for more information. Rolling Bluegrass Election Results Watch Party - Slainte (320 E Main St, Georgetown) starting at 6 p.m. Potluck. Saturday is canvassing day starting at the office (210 N Broadway #3, Berea)! From 2-5 p.m. we will be registering voters and talking to folks about issues that matter to them, there is a short training at the start for new canvassers. Additional Canvasses will be announced on the Madison County Facebook Page and through our email list. Make sure to wear comfortable shoes and bring plenty of water! If you have any questions, feel free to contact Jessica at jessicawells@kftc.org or by phone at (606) 922-6582. Wednesday evening and Saturday afternoon is for phone banking. All phone banks will be at 210 N. Broadway #3, Berea on Wednesday from 4-8 p.m. and Saturday from 12-2 p.m. This are drop in, come and go as you can events. We will be talking to folks about issues that matter to them, candidates that our members believe in and, there is a short training at the start for new phone bankers. Additional phone banks (including virtual phone bank opportunities) will be announced on the Madison County Facebook Page and through our email list. Richmond Canvass Each Thursday our VE Organizer, Jessica Wells, leads canvasses throughout Richmond. If you are joining us for the first time, there will be a short training at the beginning at Dunkin' Donuts (1029 Sylvia Dr., Richmond, KY 40475.) Make sure to wear comfortable shoes and bring plenty of water! If you have any questions, feel free to contact Jessica at jessicawells@kftc.org or by phone at (606) 922-6582. Berea Election Watch Party: starting at 7 p.m. at the Berea KFTC office (210 N. Broadway St.) Pizza, snacks, and drinks will be provided. Sign up at this link and contact angel@kftc.org or lakin@kftc.org for more information. There are no standing phonebanks or canvasses at this time, but please contact angel@kftc.org if you’re interested in seeing that happen and we can organize it! Please contact nikita@kftc.org or (502) 554-6633 if you plan to attend any of these events. Other canvasses and phone banks are being finalized in Clark County and Bath County–please get in touch if you’d like to join us. 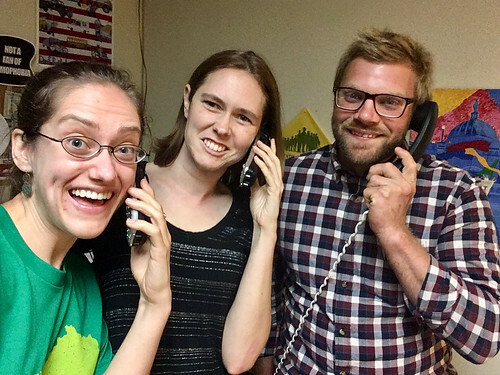 If you’d live in Fleming, Bath, Robertson, Powell, Menifee, Wolfe, Estill or Montgomery counties and would like to phone bank (either with others in your area or from the comfort of your home) or go door-knocking with us, contact nikita@kftc.org or (502) 554-6633!